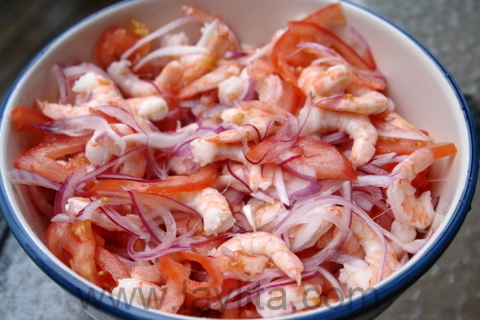 Shrimp ceviche or ceviche de camaron is one of the most popular Ecuadorian ceviches. Ceviches, also known as cebiches (both spellings are acceptable), are very popular all around Ecuador, but especially at the beach. 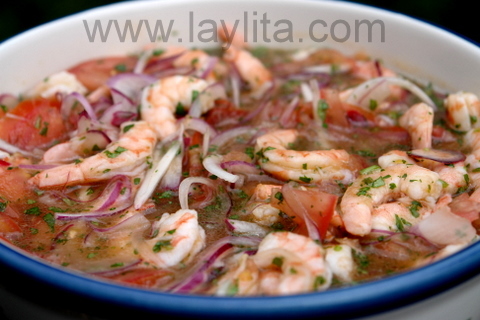 One of the great things about this type of ceviche is that the shrimp are already cooked. So if you have health concerns or aren’t comfortable with the idea of trying to make homemade fish ceviche – which is typically raw fish “cooked” by the acidity of lime juice – then this one is perfect for you, especially if you want to try it for the first time. Though making fish ceviche with fresh high quality fish and keeping it refrigerated makes it a safe to make at home dish, so once you are comfortable with the shrimp variation I recommend that you try the fish one. Mix all the ingredients together in large bowl and let it sit in the fridge for 1 to 2 hours. 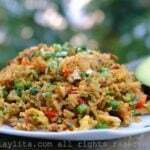 Serve with chifles (fried green banana or green plantain chips) or patacones (thick fried green plantains). 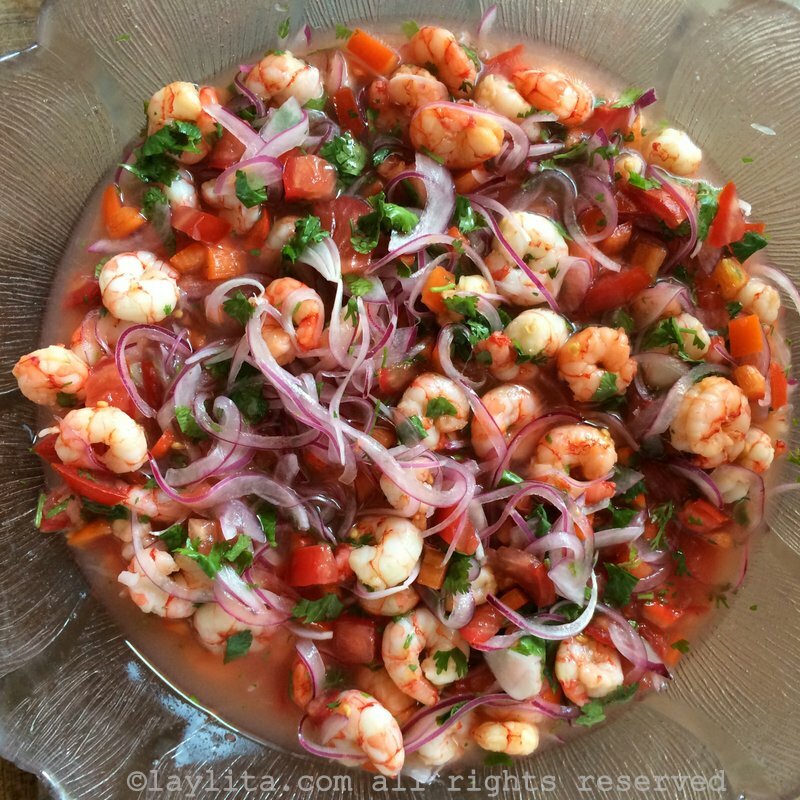 This recipe for my classic Ecuadorian shrimp ceviche is one of the easiest and quickest ways to prepare this mouthwatering Latin dish. It is also very popular and one of the most requested dishes by my friends, in fact I make this ceviche for almost every party I host. There are other spins on this ceviche dish, some are slightly more complicated but amazingly good. 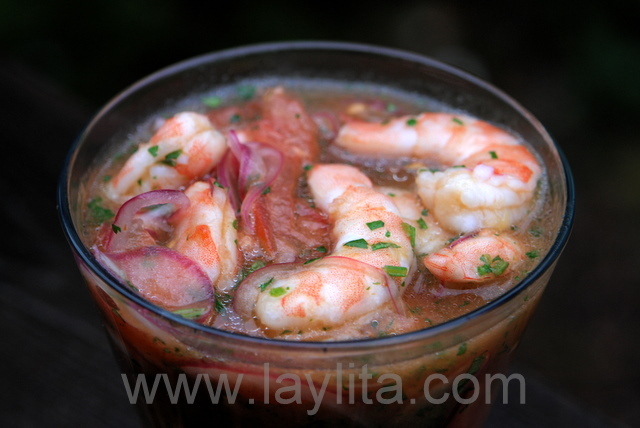 I will post these other variations of shrimp ceviche later. Ceviche is usually served with garnishes such as thick green plantain chips called patacones or tostones. 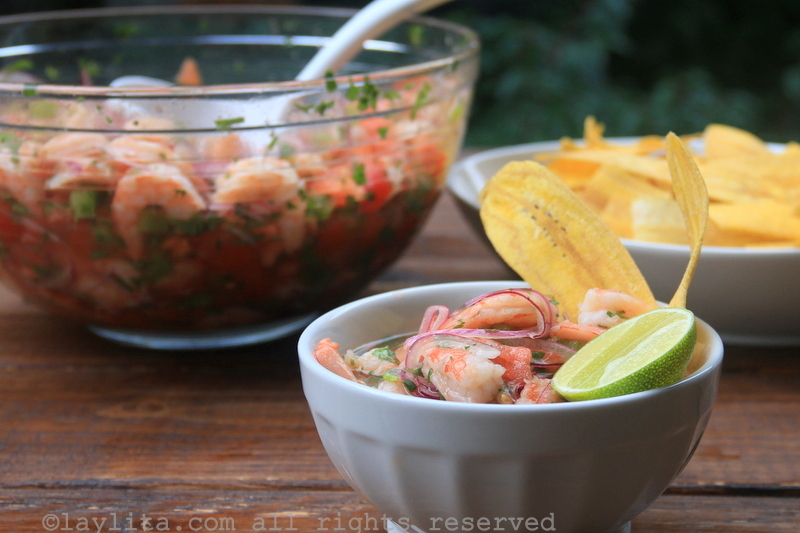 Chifles or thin green plantain chips are another popular garnish for ceviche. My favorite garnish is tostado de maiz, a crunchy corn nut type snack that goes great with this dish. In some places, especially Quito, they also love to serve ceviche with a side of popcorn. Enjoy! When you say tomato juice, do you mean literally the juice of tomatoes, or do you add other ingredients as well? Yes, just pure blended tomatoes. I’m planning on making this and would love to know how exactly you cook the shrimp in the beer, please! What type of beer? Etc. Thanks! I would use a lighter mild flavored beer (Corona, etc), or mix a stronger beer (Heineken, Stella) with water. You just need a small amount of liquid to cook the shrimp, so about 1/2 cup. Bring it to a boil, add the shrimp, cover and cook for 2-3 minutes until the shrimp change color. Don’t overcook, then drain (save some of cooking liquid if you like to add it to the ceviche- I usually blend it with a fresh tomato) and cool down the shrimp. I have been making your Ceviche for a while now and I love it however I did tweak it. Coming from Maine the one thing we do know how to cook is Seafood. Put your shrimp in the pan and pour the beer in till it just barely covers the shrimp. As you are heating up the shrimp in the beer, keep an eye on it because just as the shrimp is starting to turn pink turn the heat off, put the lid on the pan, and let it sit for about 15 minutes. The amazing thing about this is your shrimp will be thoroughly cooked through but will not be dry, tough, or rubbery it will be perfect every time. THanks for this tip. Do you think it would be a similar technique using coconut milk to cook it in? The way I prepare the Ceviche is almost the same way you do, except I marinate the onions with sugar for 15 mins then I rinse the onions with water and instead of using that many limes, oranges and ketchup I used Clamato Juice & one or two Limes. Thanks for sharing all these great recipes. Thank you very much for posting Ecuadorian recipes on the internet!!! This year we are hosting an exchange students from Ecuador and I needed a recipe from her country to make for her exchange program meeting of other students through the organization, and you provided the best recipes!!!! I love the ceviche that we eat every time we go to San Pedro, Belize, so I know I will LOVE this one and will try several different dishes from your sight since we have a student from Ecuador for the year. Thanks again so very much!!! Oh yah!!! she also had me print off recipe for empanada’s so it looks like we will be making them!!! Thanks for all the pictures they really help when making a dish from a country you never seen before or heard of!!! how many portions does it serve? If served as a main dish, then about 8-10 people. If serving as a small appetizer, or part of tasting menu in small glasses, then you could stretch it to serve 16-20. I made this ceviche last night for a group of ten people as an appetizer. It was absolutely unbelievable! All the guests raved about it. This was my first time making ceviche, but I consumed a lot of it in the month that I spent on the coast in Ecuador. This recipe was very similar and equally as good as the ceviche I bought from the vendors on the beach. Thank you for these fantastic recipes! It’s easing my feelings of home sickness! I also attempted to make chifles using platanos. They turned out nicely, and everyone ate them right up, but it was very difficult for me to slice the platanos thin enough and I do not have a mandolin. I tried using a vegetable peeler, that helped a little. Thanks!! Is this a street food (as in, not only in restaurants)? If so, how is it served? Yes, especially at the beaches in Ecuador you will find ceviche carts everywhere. The ceviche is usually served in plastic bowls or cups, topped with maiz tostado (a type of South American corn nut), chifles or green plantain chips, or patacones (thick plantain chips). 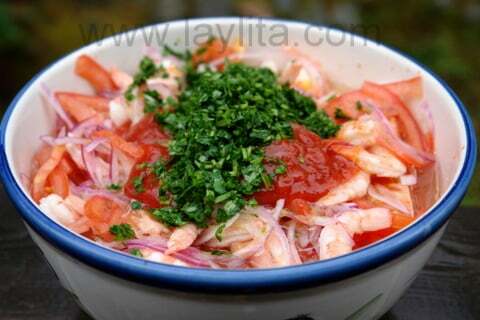 You can also ask for them to add some aji or hot sauce to your ceviche. This ceviche dish is amazing. Everytime I take it to a party it gets devoured on the spot. Peope have started to ask me to make it at all the gatherings we are invited to. 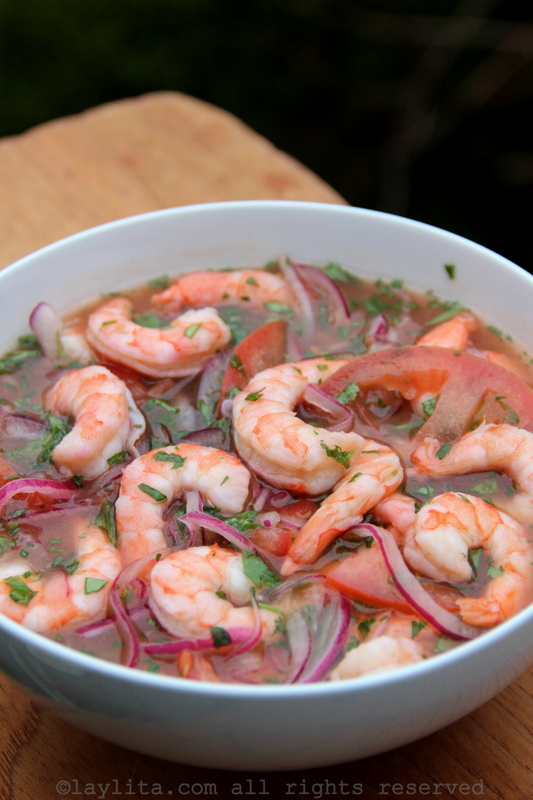 It’s the perfect blend of citrus, tomato, onion and shrimp. I add minced aji peppers for flavor too. Love it! Laylita! You Rock! 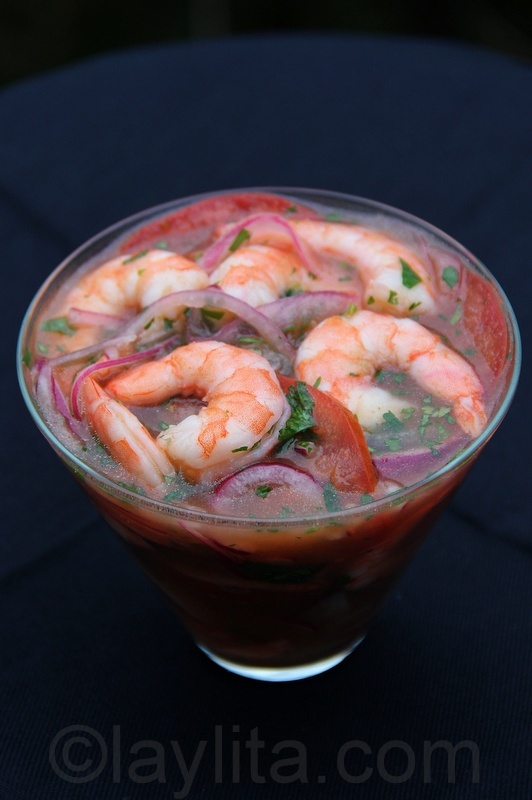 Please don’t make us wait any longer for your “more complicated but amazingly good shrimp ceviche recipe”! If it is any better than this one it will be out of this world! Thanks again for all these great recipes! I’m looking at this recipe and it does look really easy…going to try it this weekend! I’d love to get the more difficult recipe as well…are you going to post that soon or is it already posted in another section? Would love to try it!! Thank you for the excellent ceviche recipe. My father was from Ecuador and my first bite of this took me right back to the playas of Atacames eating freshly made ceviche under a beach hut. Look forward to trying some of your other recipes. Great site! I was looking for a recipe for guatita and found your site. I have now browsed the majority of your posts, with more time to log. I was born in Quito and my family moved from the sierra to the coast annually it seems. My grandfather had a sugar cane plantation outside of Santo Domingo de Los Colorados. I’ve been in the states for over 30 years now but still remember the food vividly. I am the chef in my household, and every once in a while I will introduce an Ecuadorian dish to my Gringa and our friends. Never have had a complaint. BTW, I make ceviche for every dinner party or get together per everyone’s request : ) A variation of yours, but then again I have yet to meet two Ecuadorians that make it the same. I just wanted to thank you for taking all the time to preserve these recipes for all expats and fans of our regional cuisine. Forgot to mention that a great ceviche is topped with some tabasco sauce. Only true way to eat it! thank you so much for this recipe! it is amazing! Hi there I make a similar recipe. I make the salsa the cebolla (onion marinade) first. I make stock from the shrimp shells. When the stock is done I add a little bit of fresh pepper and about 1/4 cup of ketchup (for about 2 lbs of shrimp) and mix. I cook the shrimp let it cool then I combine the onion marinade & shrimp. Then I add about 1/2 cup – 1 cup of the stock (depending on how soupy you like it)to the ceviche mixture. Serve over white rice and add some of the fantastic juice on top! Yummy. Laylita you are now my favorite recipe website of all time. 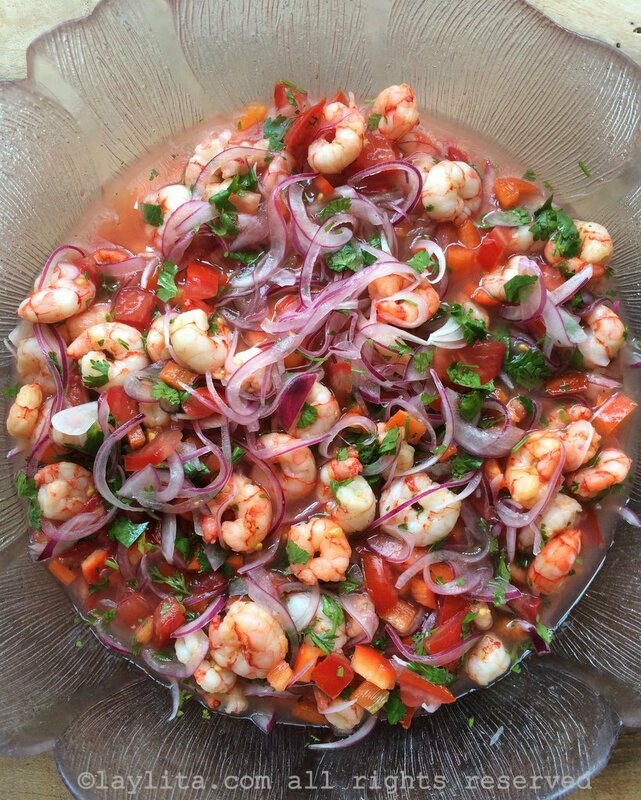 Please don’t forget about the more complicated but amazingly good shrimp ceviche recipe you promised to post later. Hi Joe – Thank you! I will post it soon, waiting for more daylight hours and better weather to get better photos of that recipe. o and if you put some cubed avocado omg it’s DELISH!!! 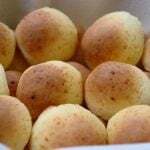 I just wanted to tell you i made this yummy cevishe recipe and my husband (who is from ecuador ) absolutley LOVED it …..he said it was better than any of the ecuadorian restuarants he ever ate it from so that made me very happy! This recipe was very easy to make and a great hit! Thanks so much for posting these great recipes! I understand. I like knowing a variety of ways to do things like this. Thank you for your recipes. I briefly cooked the shrimp as I described earlier (water, salt, and lime) then mixed it with the mango salsa. Laylita, doesn’t the acid eventually cook the shrimp (if you wanted to do it this way instead of cooking through heat) – do you know how long this takes? I think 2 to 3 hours is ideal. You can also boil 2 qts. water, throw in a big pinch of salt and the juice of one lime. Then shut off the heat once it reaches a rolling boil and add the shrimp with shells on, waiting about 4 minutes until theyre cooked inside. Then you can chill them over an ice bath and remove the shells. 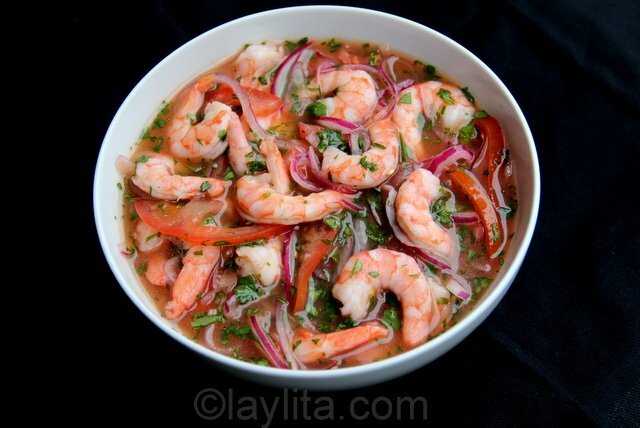 Chef Rob – Yes, the acid will cook the shrimp, but this is the typical traditional recipe that is used in Ecuador for making shrimp ceviche and in that recipe the shrimp are always boiled and then marinated, instead of cooking them in the lime juice. About 3-4 tbs oil, and salt just based on your preference, add some and taste until it is salty enough for you. I think you forgot to mention a secret part of the recipe. 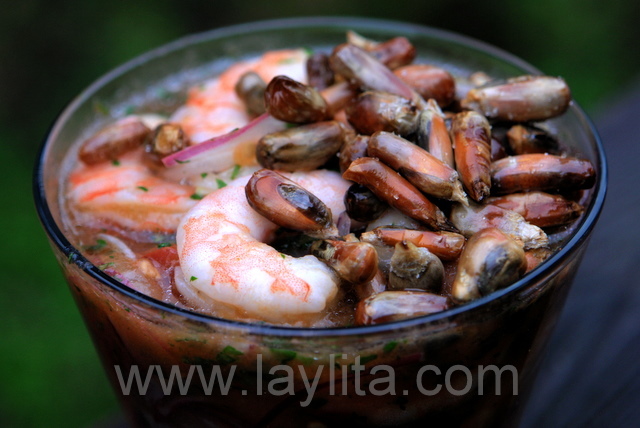 In the coast of Ecuador where cebiche originates, we marinate the onion before adding to the cebiche. The way you marinate the onion is as follows: cut the onion in thin slices, let marinate in plenty amount of salt for no less than 1/2 hour or until tender, in this way the bitterness of the onion is released, wash the salted onion thoroughly and discard the water, add lime juice (about 1 small lime/onion). Let marinate in lime juice for about 15 min. Then taste it. It should be slightly salty and sour. Now you can mix the onion(without the lime juices) with the tomato and the cilantro. Doing this in this order will enhance the flavors. 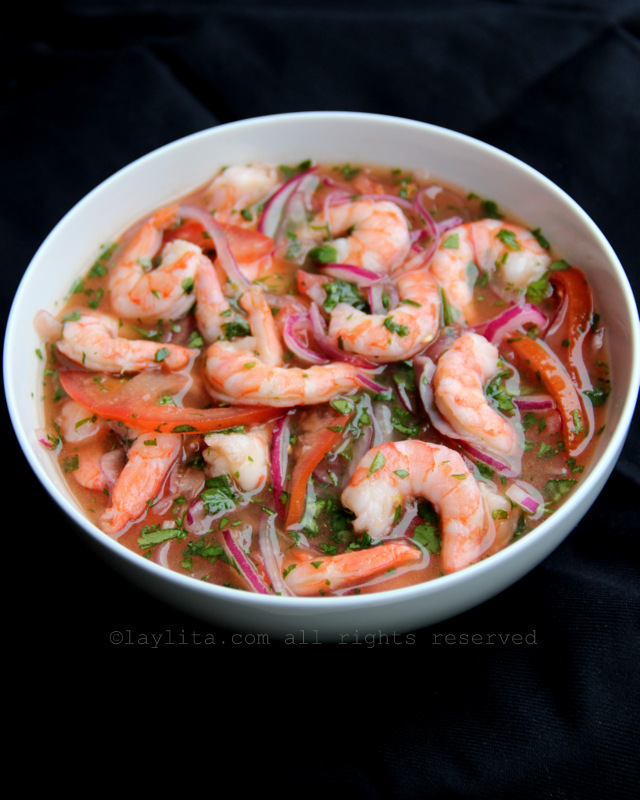 Once you add the marinated onion, tomato and cilantro and the other ingredients to the cebiche, the saltiness and sourness will be diluted so do not add salt to the cebiche. Let marinate the cebiche at least a couple of hours in the fridge and then adjust for salt if needed. You can use this “salsa” made of marinated onion, tomato and cilantro to accompany the so called “mexican tostadas” and shrimp tacos as well. Also, in Ecuador we call the lime “limon” which is different than the lemon in US. Our limon is small and brigh green. In US most limes are big. It is important not to add lemon instead of lime because lemon is slighly sweet and alter the final flavor of the cebiche. I love your recipes Laylita!!!! everything is so delicious i just had one question for you, you mention adding half beer and half water to the shrimp so it can cook. How would it work if I was to use coconut milk? Do I use half water half coconut milk also??? what do I do with the liquid when the shrimp is done cooking??? Thank you so much again i love this website!!! Hi Douglas – You can also use half water / half coconut milk, you can save the broth and use it for a soup, or someone also mentioned that they mix some of the broth with the ketchup and add it to the ceviche – personally I haven’t tried this yet so I don’t know how it will turn out but it sounded interesting. Don’t know why my last comment didn’t show up but I made this last night for Christmas eve dinner and it was delicious! I made it with beer. Thank you for a lovely recipe! I am going to make your mote recipe today. 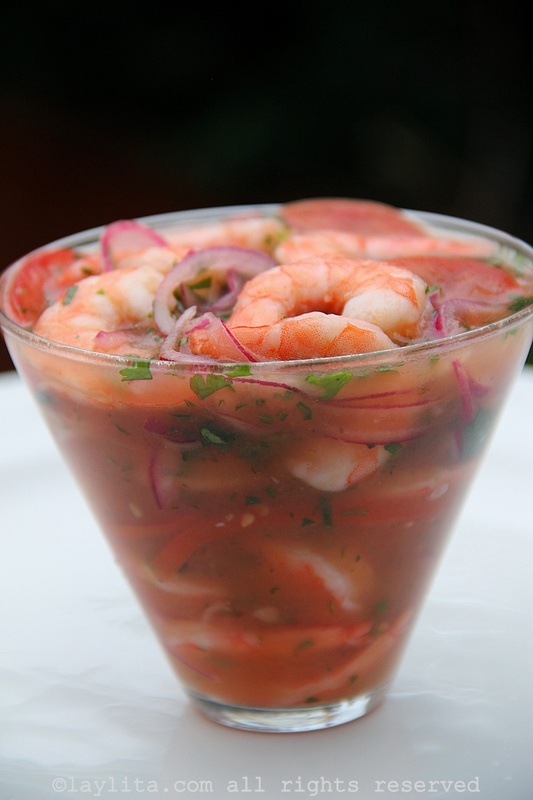 oh man…..I love this ceviche. Ps. My dad is from Guayaquil. I lived there for about three years and parents are still there. Thanks for the recipe. I use a similar recipe, but I didn’t know about cooking shrimp in beer or coconut milk. I’ll have to give it a try. In Ecuador I have in some locations been served corn-nuts with the ceviche. They go pretty well together, but patacones are still better. Thank you so much for posting all of these delicious recipes! I love all the pictures too! They make my tummy hungry! My husband is from Guyaquil, and he has introduced me into Ecuadorian food and I not only love to eat it, but I also like to try to make new things for both of us. Finding this website has been a huge thing for me, and I’m so excited because my husband has been craving ceviche de camaron. I would be very interested in your more complicated but amazingly good recipe for ceviche. Thank you so much again. I love your recipes and wish I could come and eat your cooking.